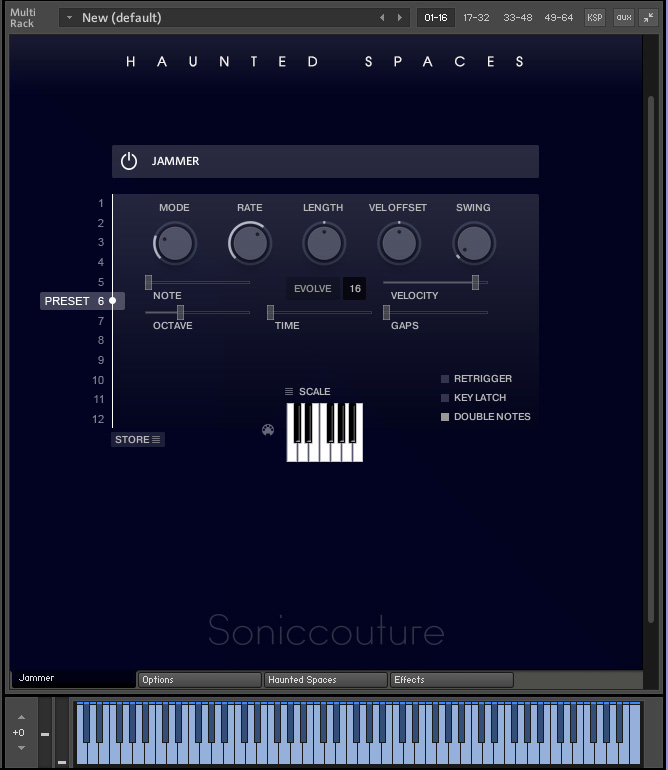 Soniccouture’s latest instrument combines recordings made in extraordinary spaces with an ultra-modern interface. Normally, when I review a sample instrument, I am focusing on the quality and range of sounds and looking at how they can be accessed and manipulated with the interface. On this occasion, however, I thought I should also listen out for a hint of the supernatural, because many of the samples were collected from locations with spiritual associations. These include temples, mines, abandoned military buildings and factories, burial sites and geological formations with religious associations — the ‘haunted spaces’ of the title. By dragging a transparent cube around inside a box, the user is able to modulate between any four sounds they have selected. It is also possible to edit the parameters of a filter, amp envelope, filter envelope and LFO for each sound.The library’s creator, wildlife sound recordist Chris Watson, made 128 recordings in locations ranging from the Orford Ness Atomic Warfare Research Base in Suffolk, to a vast disused wool warehouse in Patagonia. The resulting recordings have been fashioned into an 8GB instrument featuring 440 preset ‘snapshots’ programmed by well-known sound designers. 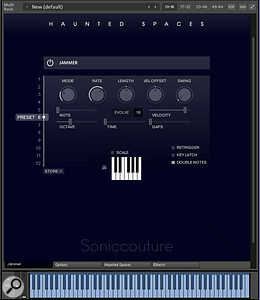 As you’d expect, from something with the word ‘haunted’ in the title, the interface is made up to look a bit ghostly. On this occasion, there are no cobwebs, just a clean-looking blue background on which four images of spooky locations fade in and out according to the movements of a cube, which very slowly bounces around inside a larger cube. Although this might sound a little strange, the inner cube is really a just a cursor; the outer one an X‑Y pad, and the four images are sample patches. In practice, the user is able to call up any combination of four samples from the instrument’s library and then modulate between them using a keyboard to trigger the sounds and a mouse or MIDI controller to move the cube. Playing the instrument doesn’t have to be any more complicated than that, but for those who want to delve deeper, a mass of editing functions are revealed when the user clicks on a couple of tiny cog icons at the top of the display. Once the editing page is in view, the user is able to play with the parameters of a filter, amp envelope, filter envelope and LFO, and also has master controls for each sample’s level, pitch, start time, pan position and detune amount. All four sections are impressively well equipped with controls, but these are fairly standard adjustments, so anyone who has ever dabbled with synth programming will know what’s what immediately. The Jammer is an arpeggiator with controls that help introduce elements of randomness into a sequence, rather than regularity and rhythm.It’s here on the editing page that the user is given the chance to record their cursor-moving performance, loop it and change its playback to either double or half speed. Elsewhere on the same display, each of the four samples has its own little icon that makes it respond to a processor called Jammer. The Jammer, which has a tabbed page all to itself, is essentially an arpeggiator, although it has quite an unconventional design, largely aimed at providing ways of introducing variety and randomness into a sequence. These characteristics are great for sound design, but the addition of a more conventional column graphic would increase its applicability somewhat. These days, every virtual instrument has some sort of effects section or page, and in that respect Haunted Spaces is no exception. In this case there is a chain of six slots into which any one of 21 effects can be inserted. These include a reverb, but there is also a separate convolution reverb (with a long list of presets), patched into a send return loop on the output. The final page to mention, called Options, is where things like tuning and pitch-bend range can be precisely specified, as well as the behaviour of the cube/cursor. When it comes to sound selection, there’s the option of clicking on a dice icon, which picks one at random, but otherwise it is done from within a set of menu pages, where the user can either search by selecting a letter of the alphabet, or clicking on one of 14 fairly self-explanatory category names, such as Winds, Metals, Synth, Percussive and Choral. Auditioning sounds can be done from the library menu pages by playing a key once the target sound is selected, and this saves the user having to do a lot of flicking back and forth between the library’s menus and the performance interface. However, the cube cursor has to be left at least partly over the quarter that’s being edited for it to be heard. 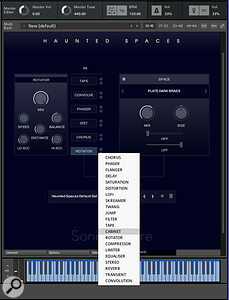 Users can select any six effects from a menu of 21 to form their insert chain and also have a separate convolution reverb available at all times.Interfaces that modulate between four or more sound sources are often used in sound-designer-specific instruments because they provide an easy and intuitive way to introduce randomness and movement into a soundscape. Choosing three or four similar sounds and moving the cursor creates a subtle effect, whereas more careful cursor movements are required when using greatly contrasting samples. But no matter which approach is taken, it’s quick and easy to generate a very satisfactory result. It might even be too easy, because almost no musical composition work is needed, particularly when non-tonal patches are used. Although there are a lot of preset sounds available for allocation into the four slots, there is something a bit generic about them all. There isn’t, for example, anything that sounds like a real acoustic instrument. It is as if every sound has been bred with synthetic or metallic DNA. 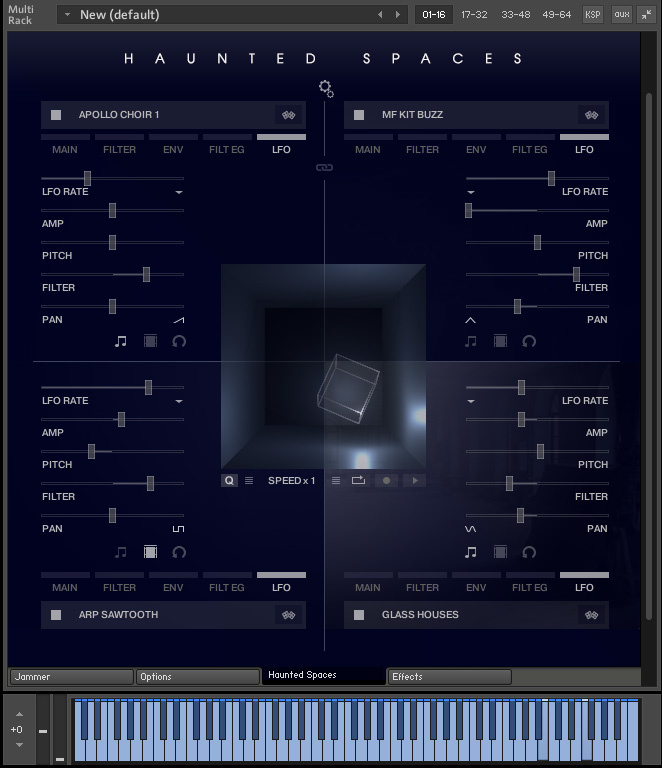 As a result, Haunted Spaces has a very particular character, which should lend itself to scoring for games, fantasy and sci-fi, as well as modern horror flicks. As for the supernatural, I must admit that I didn’t notice anything of that nature leaking from the sounds into my studio environment, but maybe I’m just not spiritual enough for that. 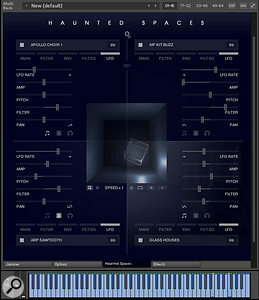 Whatever the case, Haunted Spaces will be of great interest to sound designers who are called upon to provide atmosphere and backgrounds for a range of modern media. The interface is easy to use and effective. Perfect for certain genres of modern sound design. Its sounds might just share too much of a sonic fingerprint. The arpeggiator could do with the addition of some more conventional tools. Scooby-Doo probably wouldn’t find anything intrinsically supernatural about this product, but it still provides an easy and effective way to create unnerving and spooky sound design.